Yup, we got the fluffy white stuff. Snow doesn't get any prettier than this. You know, Mom will tell you that I don't eat of of anybody's hand, and I don't come when anybody calls my name. Except, you know, sometimes. Maybe. Here I am eating out of Grandpa's hand. He's an old geezer bean. Moves slow, talks quietly, and never pesters me. So when he held out some treats the other night, and called my name, I got curious. As usual, I am tracking Santa using NORAD, so I've got a good day planned. I've already spent some time out on the front porch watching the world and the snow flurries. Everything is good here. Mom and I want to wish you all a Merry Christmas! This is what it looked like on Saturday morning. Mom did what Mom does on a cold day like this. Bake. She made biscotti, pizza dough and three loaves of her special bread. She also made two batches of cookie dough to bake tomorrow and a gigantic pot of soup. And guess what else she did? She took a quilt outside in the snow and took pictures of it. Me? I napped in my new Holiday tent. Mom says no matter how much I ask, she's not letting me out on the front porch. Frankly, I'm good with that. I'll hang out here, in my new tent. Mom has decided my tent does not fit in with the Holiday decor, so she's making me another one. She cut out all the pieces last night. Mom will also make a new cover for my pillow that goes inside the tent out of some nice red flannel, so it will be soft and cushy. I am rewarded. Mom finally bought me some food bowls that are truly worthy of me. Aren't they pretty? Mom says as long as she has to look at my food bowls, they have to look pretty, but as far as I am concerned, the ones she bought last summer with the word d-o-g on them just went too far. Mom can't put these in the dishwasher, but I'm definitely worth it. Mom got four of these bowls for me. I am such a lucky girlcat. It's December first, and Mom brought out the Santa Claus music box. He is the first thing Mom puts out for the Christymas decorations and I am always very excited every year when this happens. 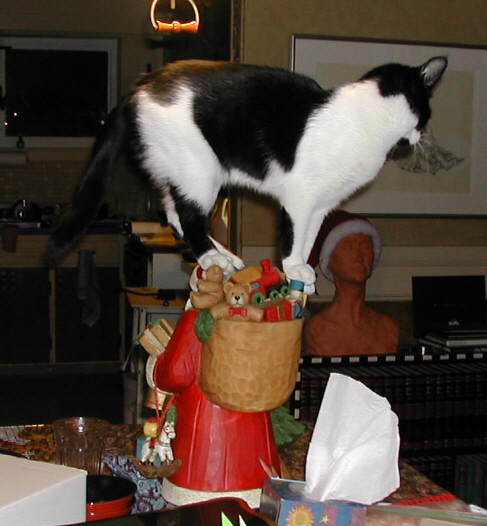 This was me the first Christymas at my new furrever home. As you can see, I liked the Santa even then. Nowadays, I like getting scritches from Mom while she eats her breakfast. As you can see she has set out the Christymas table quilt. And isn't it nice that she left my nice basket out for me.